Tiled Staircase for Property Renovation. A tiled staircase in a Manchester property combining both traditional and contemporary design. 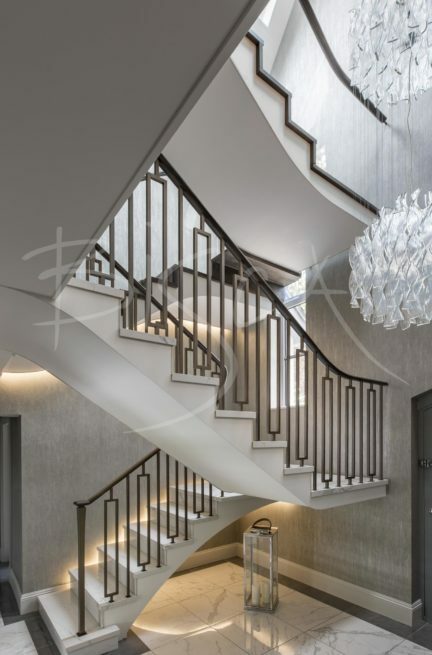 Located close to the front door, the staircase creates immediate wow factor. The two flights of stairs are similar in structure but differ in finish. Both are white painted steel, appearing to float free of the walls. Stone tiles clad the lower flight, whilst carpet provides warmth under foot on the upper flights. 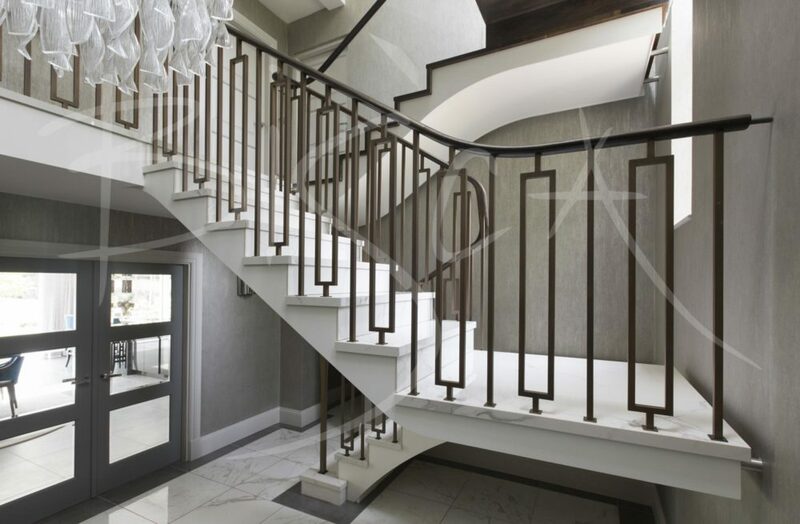 The balustrade is of bronze, square edged uprights which start in a feature newel at ground floor and climb to first. 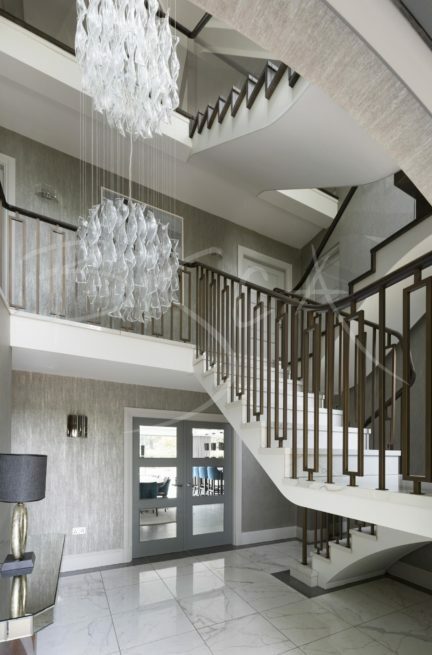 A glass balustrade continues from first to second. The whole is visually brought together by a continuous profiled handrail. 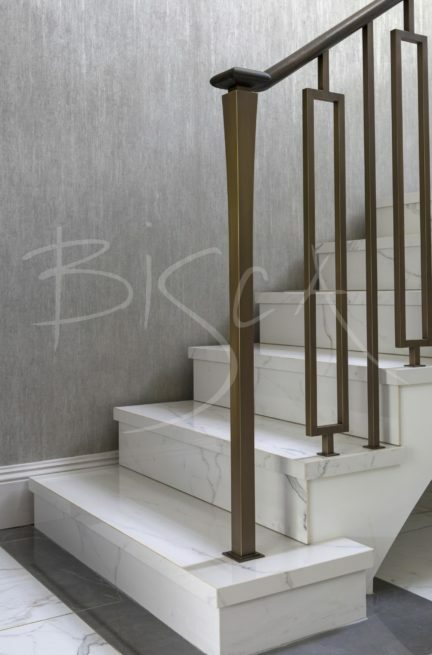 The combination of sweeping sofits, handcrafted bronze, cool stone and rich timber gives an almost sculptural effect to the staircase. Feature shadow gap lighting bathes the underside of the staircase in mellow light and works with the lighting scheme in the rest of the property. The unusual aspect about this project is that we used stone tiles for the cladding rather than traditional stone.